Animals are no less emotional than we are. Dr. de Waal is a primatologist who studies chimps and their relations. This is not the prevailing view in science, though. The most popular theory proposes only six “primary” or “basic” emotions, which are universally recognized by their facial expressions, like anger (frowning stare), happiness (laugh and smile), and fear (eyes wide open, lips stretched horizontally). All other emotions are “secondary,” which means that they are cultural constructs that make us human. But does anyone truly believe that just because an emotion lacks a specific face, we can claim it for ourselves? Open your front door and tell your dog that you are going out for a walk, then close the door and return to your seat. Your dog, who had been barking and wriggling with excitement, now slinks back to his basket and puts his head down on his paws. You have just witnessed both hope and disappointment in another species, even though neither counts as a basic emotion. You may say that it is impossible to know what a dog feels. True, yet his behavior clearly reflects an abrupt change in his emotional state. Expressed in the body, these states are perfectly observable and measurable even if the associated private experiences are not. In fact, the possibility of animal hope was experimented upon nearly a century ago by the psychologist Otto Tinklepaugh. He first let a monkey watch a banana being hidden under a cup, then allowed her into the room where this had been done. If she found the banana, everything proceeded smoothly. But if the experimenter had surreptitiously replaced the banana with a piece of lettuce, the monkey would frantically look around, lifting up the cup, while shrieking at the experimenter. Her expectations had been violated, which she rightly blamed the sneaky experimenter for. We share so many so-called secondary emotions with other species that the whole concept is questionable. There is one exception, though, which keeps being proposed as definitely cultural: guilt. This is despite the many dog owners who seem to recognize it in their pets when they hide under the table after a transgression. 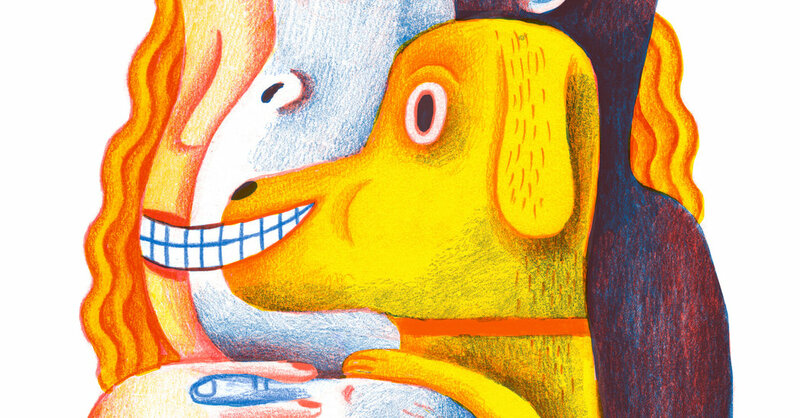 One expert in animal cognition at Barnard, Alexandra Horowitz, tested this out by having dogs meet an angry owner both when they had not broken any rules and when they had; she also had them meet a relaxed owner in the same two situations. Dr. Horowitz concluded that whether dogs take on a guilty look — lowered gaze, ears pressed back, tail rapidly beating between the legs — is unrelated to whether or not they followed orders. If the owner scolds them, they look extremely guilty. If the owner doesn’t, they still sometimes look like this, but less often. One problem, however, is that our rules are of our own making, such as “Don’t jump on that couch!” or “Keep your nails off my leather chair!” It must be as tough for our pets to grasp these prohibitions as it was for me to understand why I couldn’t chew gum in Singapore. It would be better to test behavior that is wrong by almost any standard, including that of their own species. The Austrian ethologist Konrad Lorenz gave one of my favorite examples, about his dog, Bully, who broke the fundamental rule never to bite your superior. Humans don’t need to teach this rule, and indeed Bully had never been punished for it. The dog bit his master’s hand when Dr. Lorenz tried to break up a dogfight. Even though Dr. Lorenz petted him right away, Bully suffered a complete nervous breakdown. For days, he was virtually paralyzed and ignored his food. He would lie on the rug breathing shallowly, occasionally interrupted by a deep sigh. He had violated a natural taboo, which among ancestral canines could have had the worst imaginable consequences, such as expulsion from the pack. Among the primates, the most suggestive cases of remorse concern bonobos. These apes are as close to us as chimpanzees, but far more peaceful and gentle, which means that they almost never hurt one another. Whereas in most primates reconciliation after a fight is typically sought by the subordinate party, in bonobos it is the dominant animal that seeks to make amends, especially if he has inflicted an injury. He may return to his victim and unerringly reach for the exact same toe that he has bitten and carefully inspect the damage. He obviously knows precisely what he has done and where. Then he spends half an hour or more licking and cleaning the wound that he himself inflicted. Another human emotion that has been elevated to a special status is disgust. In his book “Human: The Science Behind What Makes Us Unique,” the neuroscientist Michael Gazzaniga views disgust as one of the five emotional modules that set us apart from all other animals. Here, too, dogs are a prime example, given that they eat feces and lick their testicles. This is taken as proof that dogs must lack disgust. But give your dog a cut lemon (not recommended) and you will see a full-blown yuck! response with curled-up lips, drooling and withdrawal from the sour smell. Disgust is an incredibly adaptive response. Every organism needs to avoid parasites and prevent the ingestion of harmful foods (citrus fruits can be poisonous to canines). Ignoring this mundane origin, however, psychologists have fallen in love with the moral connotations of this emotion. We are disgusted, for example, by someone who fakes a racist attack on himself in order to gain positive media attention. We “turn up our noses” at such people, showing our typical disgust face with wrinkled nose and narrowed eyes. But even if moral disgust is special, it is no accident that our facial expression also blocks wafts of foul air from getting into our eyes and nostrils. This hints at the emotion’s origin. Chimpanzees show the same expression when it rains, something they hate. As soon as a downpour starts, young and old pull an ugly face known as the “rain face,” in which they bring their upper lip close to their nose and stick out their lower lip. Having grown up in the Netherlands, I know this expression firsthand from watching the throngs of cyclists in Dutch cities. Whenever it pours, they show rain faces inside their plastic ponchos, evidence of their dismay over the prospect of wet clothes for the rest of the day. Disgust is in fact so predictable in apes that an adolescent chimp I saw regularly at the Yerkes National Primate Research Center, in Georgia, turned it into a game. The chimp, Tara, would occasionally find a dead rat in the outdoor enclosure and carry it around by its tail, careful to keep it away from her own body, then stealthily lay it on the back head of a sleeping group mate. Her victim would startle as soon as she felt (or smelled) the dead animal, loudly screaming and wildly shaking her body to get this foul thing off her. She might even rub the spot on her body with a fistful of grass, to make sure the smell was gone. Tara, for her part, would simply pick up the rat and move on to her next target. Apart from the question of why she considered this game fun, and why we humans immediately see its humor value, it would obviously never have worked in a species that lacked disgust. But that is not all. We also have experimental studies, such as those by the primatologists Cécile Sarabian and Andrew MacIntosh at Kyoto University, who explore the yuck! factor in wild macaques on a Japanese beach. They place small food items, like grains or peanuts, on top of a variety of objects. Some of these objects are piles of plastic made to look like feces; some are actual piles of fresh feces. Most of the monkeys are disgusted enough by the latter to forgo the food. And if they do pick up food from the feces, they frantically rub their hands afterward. Tested in the same way, bonobos refuse to touch banana slices contaminated by feces. Given how much apes love bananas, this attests to their deep revulsion. For the longest time, science has depicted animals as stimulus-response machines while declaring their inner lives barren. This has helped us sustain our customary “anthropodenial”: the denial that we are animals. We like to see ourselves as special, but whatever the difference between humans and animals may be, it is unlikely to be found in the emotional domain. Frans de Waal, a primatologist and professor of psychology at Emory University, is the author, most recently, of “Mama’s Last Hug: Animal Emotions and What They Tell Us About Ourselves,” from which this essay is adapted.